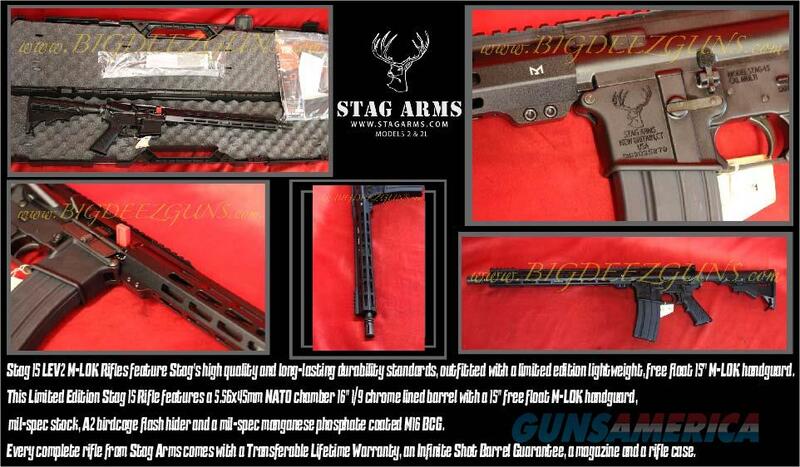 Description: Stag 15 LEV2 M-LOK Rifles feature Stag's high quality and long-lasting durability standards, outfitted with a limited edition lightweight, free float 15" M-LOK handguard. This Limited Edition Stag 15 Rifle features a 5.56x45mm NATO chamber 16" 1/9 chrome lined barrel with a 15" free float M-LOK handguard, mil-spec stock, A2 birdcage flash hider and a mil-spec manganese phosphate coated M16 BCG. PLEASE CONTACT FIRST FOR AVAILABILITY!!!!!!!! !